Discussion in 'Online Games - News and Reviews' started by Kotsy, Jun 7, 2013. In the land of childhood fairy tales, Alice in Wonderland has your imagination running wild. WinaDay Casino has brought this all time classic fairy tale into the adult world and created an incredible Online Video Slot to play for real money. Alice in Wonderland offers a continous growing Jackpot. The graphics and sounds brings this classic fairy tale to life. 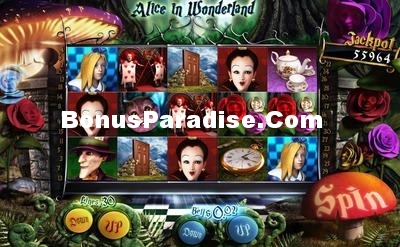 Alice in Wonderland is a 30 line, 5 reel video slot. Players can place a range of bets, but go for the maximum to hit the Jackpot. All wins pay left to right except the Alice Scatter. Winning symbols are Queen, Cheshire Cat, Mad Hatter, Queen of Hearts, Face Flowers, Door, Time Watch, Tea Kettle. Twiiddledee and Twiddledum are wild and can expand on any reel. Receive 3 or more Alice symbols and start the free spin feature. Feature can not be retriggered. Is Alice in Wonderland your fairy tale slot? Really like the free spin round on this one. I love Alice in Wonderland! And i never seen this game before. Sure going to give the Alice in Wonderland slot a few spins this weekend at Winaday Casino!